Do you have a philatelic related New Year resolution? Well, here is one, perhaps? 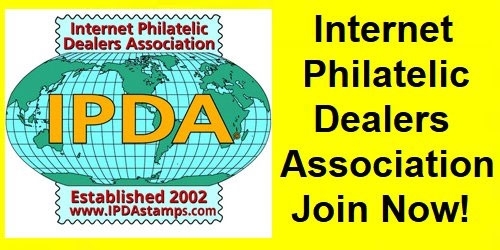 Join the Internet Philatelic Dealers Association, the IPDA. Yearly membership just USD $20. How can we at the IPDA convince you to consider joining us and becoming part of what we are trying to achieve. For 2019…… our target is an IPDA with 300 members, (if just 15% of sellers here joined we would be nearly there, an IPDA where our initials are recognised far more in the philatelic community than they are today and, a web site where we offer even more functionality for our members. And the benefits from joining us? Please have a look at www.ipdastamps.com, they are listed, and there are FAQs which should answer any questions you may have on the About Us drop down menu, and there is an easy to complete online application form. Please mention you saw this ad. We look forward to welcoming you. Happy New Year, Michael IPDA General Secretary. I have resolved not to be such a bad influence on myself. Oh wait, philatelic resolution.... hmmm, maybe to make a better effort to add material to my store inventory faster than it gets purchased. It can be a real struggle.